"Know yourself, know your enemy, and you shall win a hundred battles without loss"
The Cyber Security risk is a reality we can no longer ignore. We live and work in a digital world where an enormous amount of personal data is being transferred and held by organisations and third parties. Who is responsible for the protection of that data? If you don't know, you should. Today's threats go beyond traditional boundaries and can now manifest on any electronic device or within any virtual environment. This includes mobile devices, televisions, computers, gaming consoles, vehicles, plant equipment, medical devices etc. Cybercrime has become the most dominant threat to people and economies world wide and can negatively affect all of us. Every electronic device that connects to the internet is vulnerable and creates a serious risk to organisations, their staff and their customers. Privacy is a fundamental human right and if you hold personal data other than your own, your organisation and Directors are legally responsible for the safety of that data. 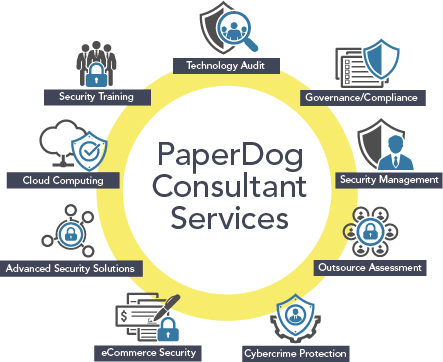 Through the use of policy, protocols and best practice methodologies, PaperDog will help develop security and attack mitigation strategies, identify risks and implement Security best practice methodologies into your existing business ICT structure. We provide Security Management and reporting frameworks that align technical and business governance with privacy and security by design best practices to enable organisations to operate within cyberspace with confidence. PaperDog Consultants are independent and are here to look after your business, not the vendor, not the service provider... your business. Contact us today to find out how to take back control of your technology. A Technology Audit provides the blueprint with which we help you build the frameworks required to understand your ICT environment and the tools to keep it safe and up to date. The protection of your business data and networks is a responsibility shared by all who are affiliated with your organisation. Effective security awareness is the foundation of successful ICT governance. Through governance and effective strategies, PaperDog can help your organisation deliver a framework to provide direction and coordinated management of information security. ©2004-2017 PaperDog | All rights reserved.